Sometimes, life just gets in the way and getting things finished turns out to take a long time. However, I am usually a finisher, even if the process is long and convoluted, and I’m pleased to report that I have now produced a completed sample. It’s taken ages to produce this piece, and I’ve mostly worked on it in lots of short bursts of a few minutes at a time. 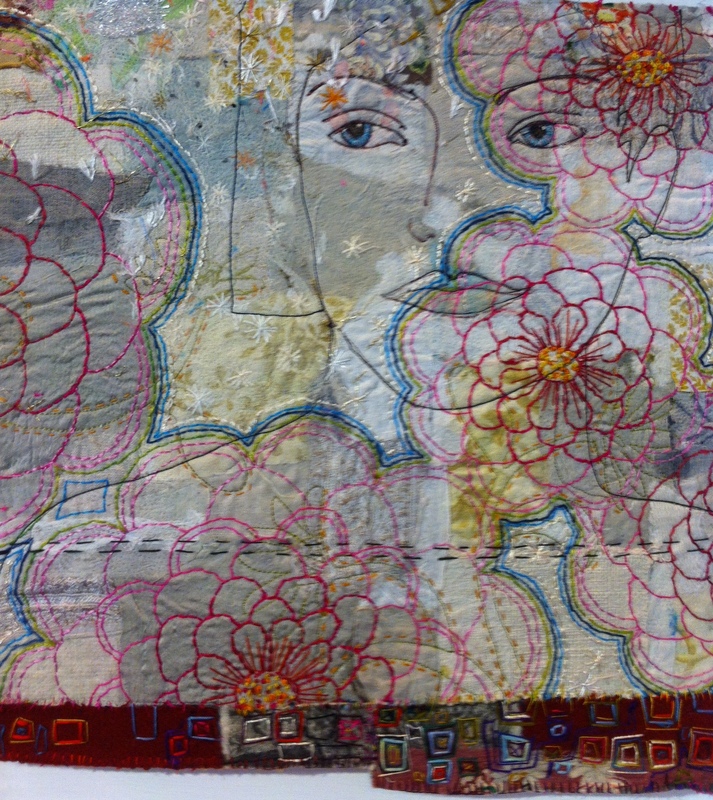 When I look at it now I am reminded of the day I finished it off by doing the hand-quilting. I had the most appalling toothache, and felt very low because of it. However, I stuck to the stitching doggedly throughout that day, being unfit to do anything else, and I’m sure it helped. I’m pleased with the finished sample because I think it contains the elements that I liked about the original, but is not a slavish copy. 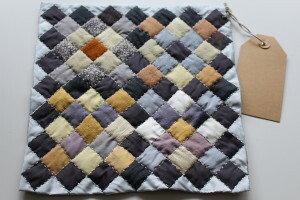 I like the colour combinations, and the effect of using a range of different fabrics. This has habotai silk, silk brocade, dupion silk, cotton lawn, wool and a little bit of linen. I love mixing fabrics up. Over the weekend I’ve been making some nine patch pieces. 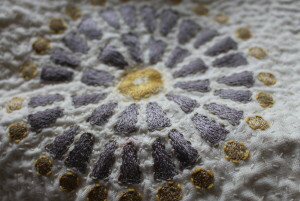 These are mostly made of silk but the russet coloured piece in the middle of the main patch here is lightweight wool and there are some cotton patches in the piece with the needle in it. I love mixing up fabrics. I’ll make a few more and then think about what to do with them. These are one inch squares, so pretty small and fiddly. But relaxing to do, and very small so they can be easily carried about when travelling. I spent the weekend in Ludlow in Shropshire, which I think I’ve mentioned previously on this blog. It’s a fantastic place with excellent shops. I bought some clothes, rather expensive but lovely, and had a good time looking round the market. On Saturday it’s food, on Sunday antiques and general junk. Just a short post today. I’m off to London in a few minutes, for a meeting tomorrow. I’m going again next week for one or two visits (number of visits dependent upon stamina) to galleries. Today I’ll be staying at Earl’s Court so if the weather’s not too hot, and if I have the energy I might walk up to the Victoria & Albert Museum for a cup of tea and a wander about. Having been bogged down with work for so long, I didn’t think there was any realistic chance of getting to the Festival of Quilts at the NEC in Birmingham. But I redoubled my efforts, worked my socks off on Friday and Saturday, and by Saturday evening got to the end of it. This freed up Sunday, and I decided to get up early and head for Birmingham. This plan worked well in that I thoroughly enjoyed my day out, but it had one major drawback which was the weather. It was atrocious. Apparently we are getting the tail end of Hurricane Bertha. And if this is the tail end I don’t like to think what the beginning and middle must have been like. Driving was really difficult and unpleasant, and it took me almost 3 hours each way. So that’s a lot of time just sitting in the car. Still, preferable to sitting at my computer working. I put the radio on and listened to Radio 3 (the BBC’s classical music channel) all the way there and back which no doubt did me a lot of good. So, what was it like? Well, for starters, sparsely attended. I was at the FoQ two years ago and there was a vast crowd. One of the stallholders told me that the first three days of the show had been pretty busy, but Sunday was quiet. It’s quite possible that other people were more sensible that I was, and decided to stay indoors rather than experiencing the vile weather. Anyway, it made it a pretty nice experience as it was so easy to get about. I spent around five hours there in total, and there was lots to see. As on the previous occasion, I was fairly unimpressed with quite a lot of the exhibits. 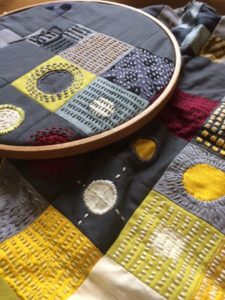 While the craft skill level is very high, I think the quality of design and composition left something to be desired in a lot of the contemporary quilts – although there were of course exceptions. On the whole I preferred the more traditional designs; this may simply reflect my love of geometric design. The black squares are velvet, and they serve to make a frame for, and to set off, the brighter colours. Very effective. 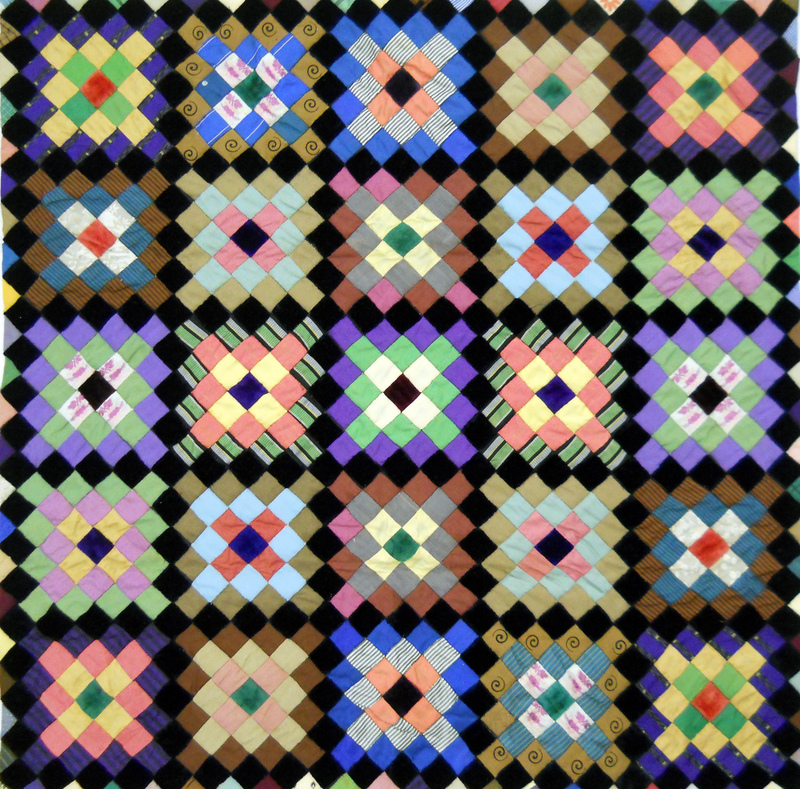 The theme of the Quilters’ Guild exhibition of half a dozen items was ‘Mosaic patchwork’, which is another way of saying ‘English paper piecing’. I liked it very much. Apart from the exhibitions, where I spent most of the time, there is of course a lot of shopping opportunities. There’s not that much I need or want, really, but I did buy some silk sari strips and some pieces of grey silk from The Silk Route. And I got one of the helpful ladies on the Bernina stand to give me a demonstration of how to thread up and use an overlocker, as I sometimes think about buying one. Does anyone have any views they’d like to share about overlockers? Have you got one? Can you recommend a particular brand? Please let me know either via comment or email. Regular readers may remember me wittering on a few weeks ago about my proposed entry for the Carrefour Européen du Patchwork on this year’s theme ‘Imagine’. If you read that far, you’ll know that I failed to make the deadline for this (26th June) and was consequently somewhat downcast. Since then, the unfinished piece has been sitting around in the spare room as I’ve not felt motivated to get on with it, and indeed, I hadn’t decided whether or not it would be worth finishing. Last week my stitching friend Bren came over for one of our stitching day meetings. These are supposed to take place about once a month, but it’s more like every eight weeks as we both have lots of other things to do. 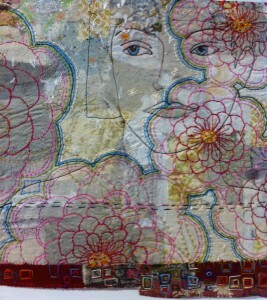 I didn’t have anything on the go for the stitching day, apart from my ‘Imagine’ quilt, so I got to work on it. Bren said she thought it was lovely and recommended that I should finish it, as I could try exhibiting it elsewhere. Good idea! It would be a lot of wasted work to abandon it now, and I feel re-enthused by getting some positive feedback on it. So, since then, I’ve been doing a few minutes of stitching every now and then, and as I’ve found in the past, if you do this regularly, even a large piece will sooner or later get finished. I’ve chosen quite a limited range of colours – mostly greys with some yellows. I made plastic templates of the letter forms I wanted to use, then drew out the design in pencil, using the templates as stencils, on a piece of lining paper of the right size. When I was happy with the arrangement I pressed the linen, laid it out on the kitchen table, and drew the design, again using the stencils, in a very hard, fine pencil. 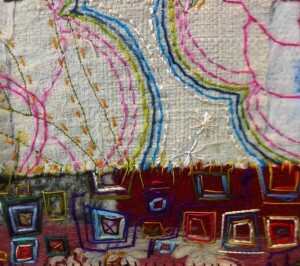 Then I set up the sewing machine and filled in the shapes using free-motion machine embroidery. This bit didn’t take as long as I’d thought it would. The thread is Madeira rayon, which I like very much. 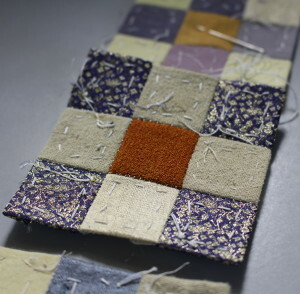 Then I put together the quilt sandwich, using cotton batting and a plain calico backing, and started the hand embroidery. WELL…. what a massive job that has turned out to be. I am making a line in running stitch around each coloured shape, and then quilting the background using, not Kantha stitch, but seed stitch. This gives a very nice nubbly effect to the quilt. 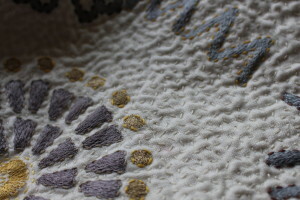 Here’s another close-up showing the texture. You can see a little bit of the M stem at the top of the photo. I’ve mostly finished outlining the shapes but there is lots of the ground work still to do. Perhaps I’ll finish it, perhaps I won’t…. if I do, it will be largely because of Bren’s encouragement. So… thank you Bren! This is not quite the same as the brand I bought which has a Japanese label and the word ‘Suncoccoh’ on it. 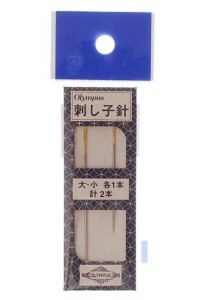 I bought mine from Euro Japan Links Ltd – the pack of six needles for £3.60 sterling or 5 euro. It’s an excellent product, and if you’ve not tried it for this type of work I can thoroughly recommend it. Oh, and I did use the needles for some sashiko work. One of the City & Guilds Diploma course requirements is to study and write about textile work in three different countries. I chose Japan, Afghanistan and Peru – all well worth the effort. 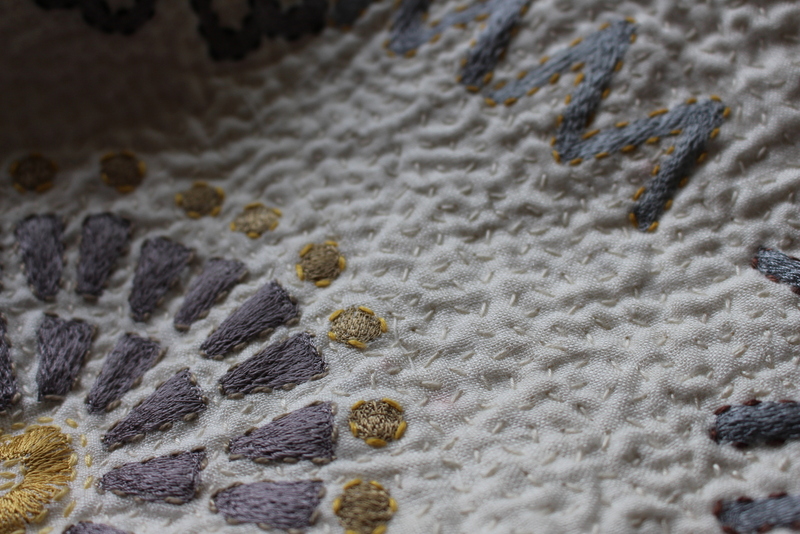 A requirement is to work a piece in a typical style of the country, and I worked a couple of sashiko pieces. 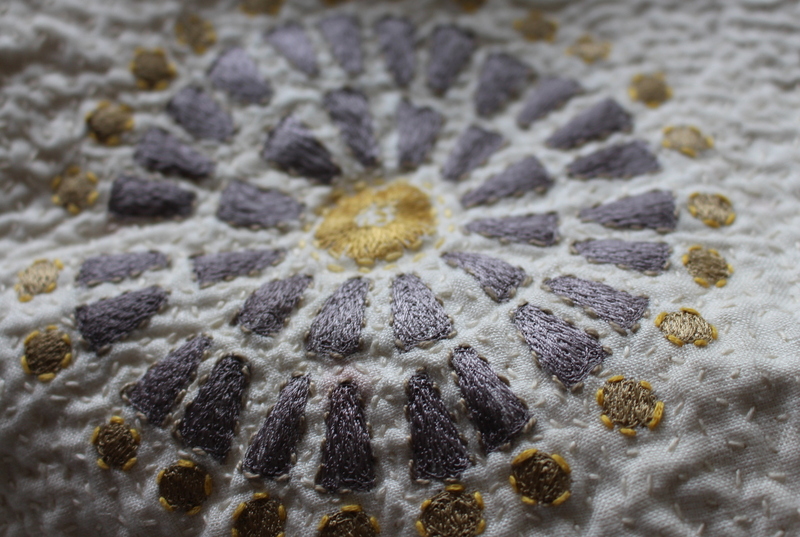 I loved making the pieces and I really like the plainness of traditional sashiko work. Don’t know when I’d ever find the time to do more, though…. The accompanying text explains that it’s an example of a Canadian Red Cross quilt; these were sent over from Canada to Britain in their thousands during the Second World War as donations to the war effort. 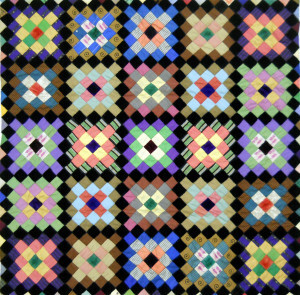 The intention underlying these quilts was to produce an item whose function was, simply, to keep people warm in difficult circumstances. Accidentally, though, it manages to achieve elegance and beauty. 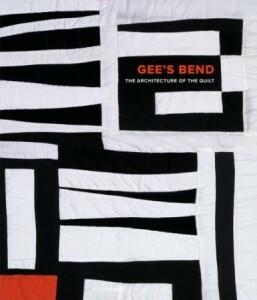 The quilt is made of rectangles and squares of suiting wool. Because no two pieces are the same, it is thought that the fabric comes from a sample book. 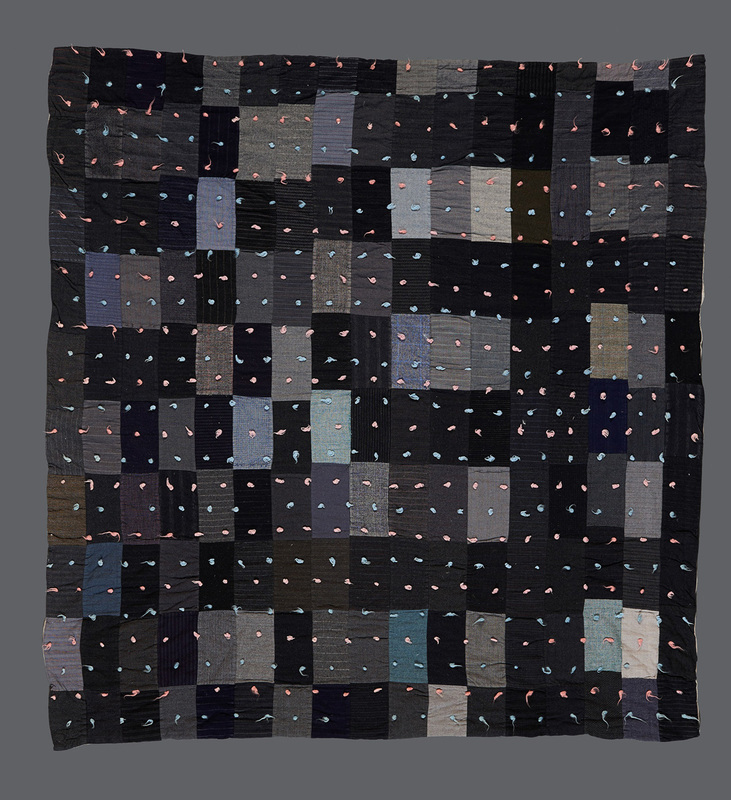 The quilt is tied with pink and blue wool, probably because that is what came to hand at the time, and, as the description points out, tying is a quicker method of quilting than stitching. So, in summary, it appears that this piece was put together quickly, out of whatever materials serendipitously presented themselves, and its focus was on function, not ornament. Isn’t that interesting? One of the big challenges, it seems to me, about creating or designing anything, is to establish constraints of materials, colours, shape and so on. Where there is a superabundance of materials available, which is the case for many of us, how do you go about making these choices? 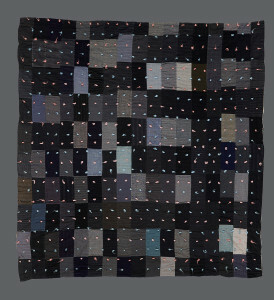 I’ve been thinking about this in any case, because of the Matthew Harris course that I wrote about a week ago, but this Canadian quilt has helped to focus my attention on the matter still further. 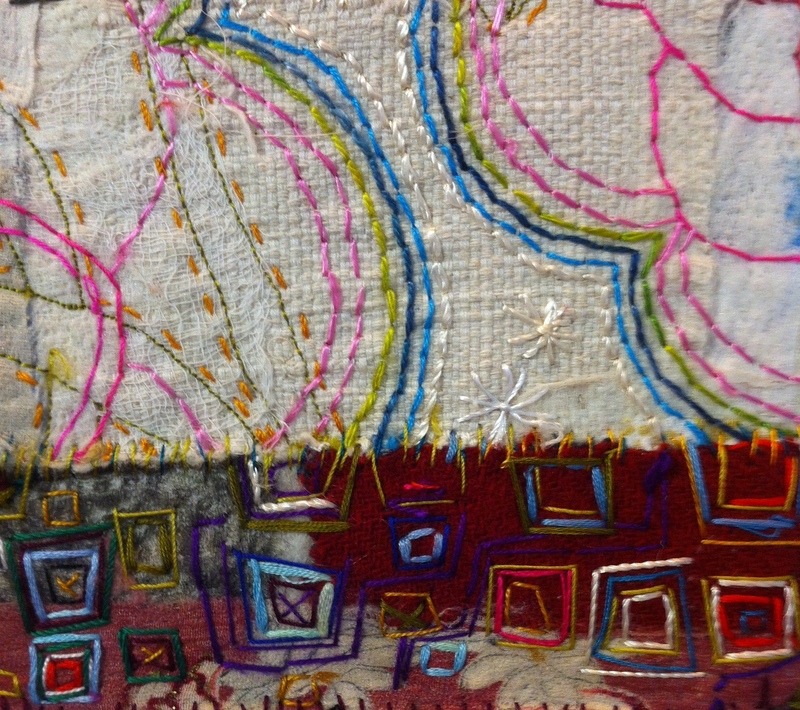 Some of the most striking and lovely examples of textile art (e.g. the Gee’s Bends quilts, and Japanese boro work) are the result of the use of scarce and precious resources in the form of rags. In my own recent family past, rags were used routinely to make rugs, and jumpers were unravelled when worn out with the better elements of wool preserved for making into something else. It’s not always the case, of course, that accidental elegance will result; in most cases this probably won’t happen. But sometimes it does, and then something wonderful is created. Mine is 3rd from the left on the top row. Brenda Gael Smith, the curator of the travelling exhibition, has been super-busy arranging new venues. So far, it’s been confirmed that the exhibition will show in 11 different venues in Australia, New Zealand and the USA, but it looks as though there may be more to come. The current list of dates and locations is on the Living Colour! website. 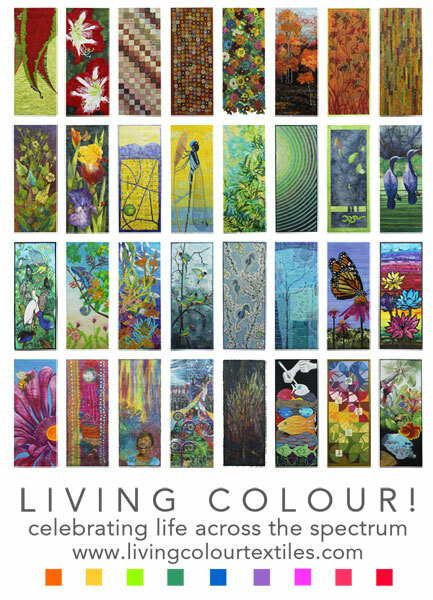 Also available is a print catalogue showing the exhibits in more detail – an online preview of the catalogue can also be found on a different page of the website. 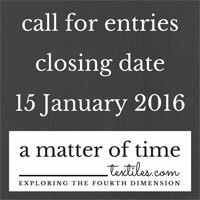 Needless to say, I’m very pleased that my work has been selected for this exhibition. I’m just sorry that I’m unlikely to see the exhibition, as all the venues are a long, long way away, especially for someone who dislikes air travel as much as I do. 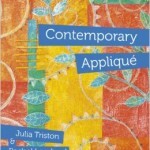 However, the catalogue looks like a high quality production, and it should give a good insight into the working techniques and methods used to produce the 32 exhibits.